$Address_Sheet2$; Save cell address in the sheet2. 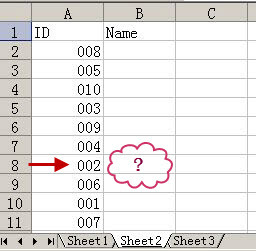 $ID_Sheet2$; Save ID value in the sheet2. $Address_Sheet1$; Save cell address in the sheet1. 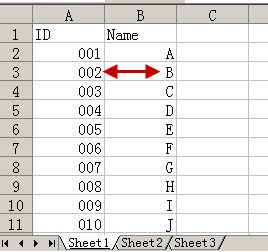 $ID_Sheet1$; Save ID value in the sheet1. $Name$; Save the matching Name value in the sheet1. $ID_Sheet2$=<ReadCell()>; Get a value from the cell selected by cursor. $ID_Sheet1$=<ReadCell($Address_Sheet1$,"Sheet1")>; Get a value from the specified cell address in the active workbook. While($ID_Sheet2$,"<>",$ID_Sheet1$); Comparing the two values until equal.